Thank you! It kind of crept up on me without me noticing. Oh thank you! And a hug to you and Sirio – but don’t forget Oklahoma too! That made me smile! When was this, Kate, if you don’t mind me asking? It sounds as if it might have been back in the day before the restoration of the park and the glasshouses? I love the place as it is now, but I also loved it then when it all had a completely different ambience, and the image of the pompous cat fits with what it was like then. Thanks for the story! Lovely post. Congrats on 200. Optimism in a bear is very desirable quality. So that makes life immediately better. I am with you on the sitting on the ground in the big outside. Thanks David! And I’m glad to hear that you agree about sitting on the ground – I’m sure there are all kinds of reasons, zen, tao, magnetic, druidic, creative, scientific; all I know is that I know it to be true! It’s fun to see these, and your observations about the process forcing you to get low and slow down are interesting. That makes sense. You’ve had this happy little guy since you were two, that’s cool! I don’t have anything from when I was really young, but my mother saved a tiny bear from her own childhood, and I have that. It’s very, very threadbare, and very comforting. Here’s to two hundred more creative posts, whenever they are ready to happen! Thanks! 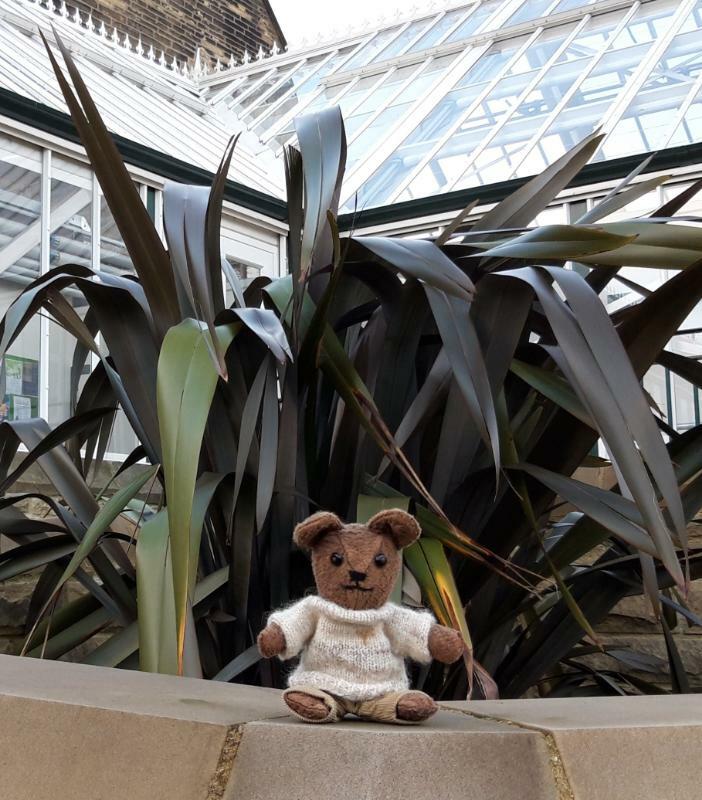 So interesting that you have a little bear that’s even older than mine – well, a lot older – and Treacle is pretty threadbare too. As you say, that’s part of the appeal, and part of what’s comforting. He’s actually attracting quite an audience after appearing here and on Instagram. Treacle, what a gorgeous name for a small brown bear! It’s good to be grounded with a reliable little pal. It is good, isn’t it? And I agree, his name suits him. Thanks! What a lovely post! I’ve been away from WP for a while, and couldn’t imagine a sweeter post to come back to. Me too I still have my teddy bear (and a little piece of cotton cloth that I always kept with me, otherwise I couldn’t sleep), but it’s just laying in a plastic bag for the moment. I never gave my bear any name either, I guess I simply called it my “teddy bear”. Great to see the relationship you too are still having, and the new adventures! How lovely to hear from you! I just read your post about crocheted earrings and they’re delightful. I’m very interested that you still have your teddy bear (even if you never felt the need to give him a name!) – and that piece of cloth! (Write about them sometime???!) Welcome back! Oh, hello–lovely post. I especially recognize that “helter-skelter of the mind”–well said. I have my childhood bear, too–Theodore Cinnamon Anchorbear III–I especially wonder where I came up with “the third”! He and my sweet-faced doll, Jenny, have been tucked away in a cedar chest for years. You’ve inspired me that this weekend, I may invite them out for a visit. Hope all is wonderful with you, and that springtime is finding you at home. I’m enchanted by the sound of Theodore Cinnamon Anchorbear III – (I’m particularly taken with the Anchorbear – it sounds like all that a teddy bear is, somehow) – and I’m so hoping that you will indeed invite him and Jenny out for a visit. (And hoping – dare I? – to hear all about it…. )!